I colored my hair about a month ago. I dyed it a wild burgundy purple shade. Now, if I plan on keeping that color in my hair for a while, I have to use color safe hair products. Arvazallia, which is a brand that I have used before and liked, also makes a Color Care Shampoo and Conditioner line. These three come in nice bright bottles and a big ol' jar. I've mentioned before that I don't shampoo my hair often, especially when it's colored, because it tends to dry it out, make it bleed a lot, and dramatically strips the color out. I've used this brand before, but this only started using this type for colored hair for a couple of weeks. I used this shampoo and my hair did bleed but not the way most shampoos cause it to do. The color is still in my hair so I'm happy. The scent is okay. I don't plan on using the shampoo too often, unless my hair gets really dirty because my hair responds better to a regimen that consists mostly of conditioner. This conditioner works very well. It softens my hair and smooths it out. My hair color only bleeds a little, occasionally, but that's probably because it's not permanent and it's a dramatic shade. Like I said it only bleeds a little though. 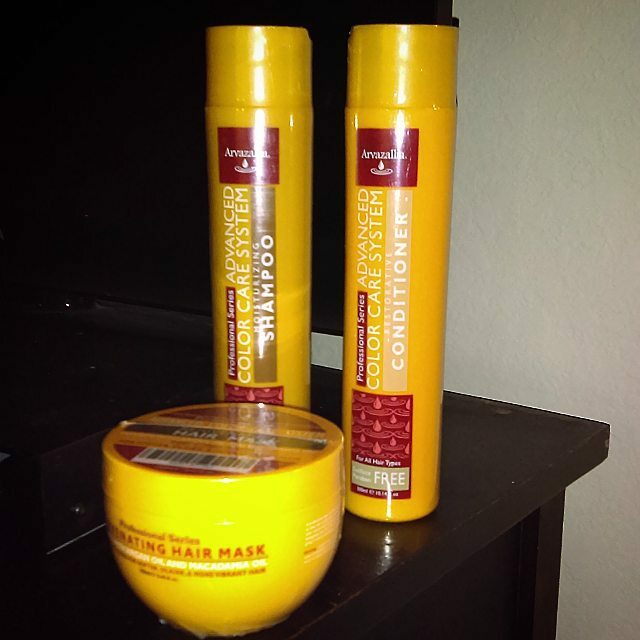 My hair looks like its in good condition and I definitely believe that using this hair care line has contributed to that. It smells alright and gentle on my colored curls. The brand makes great hair masks. I plan to use this once a week. It works the best when it sits on my clean, wet hair while I shower or left on under a plastic cap for an hour while I clean house or whatever. Then, for even better results, especially since my hair is colored, I rinse with the coldest water possible and after squeezing put the excess water on my hair and then I just wrap it with a cotton t-shirt to dry. It deep treats my hair, leaving it in great condition. It has an okay scent, nothing too strong. All of these products are available for purchase on Amazon.